A funny and creative black comedy about a professor dealing with some issues and spending time with his students during the course of a single weekend. 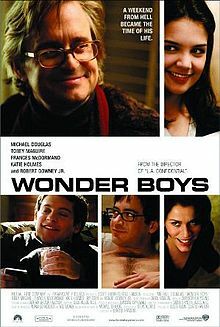 Wonder Boys is a very unusual and interesting movie. 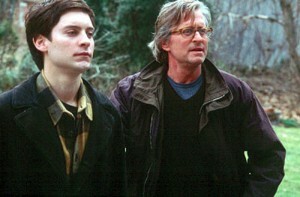 it’s the movie about a professor, named grady tripp (michael douglas) who has a sort of awakening kind of weekend. and it’s not that anything crazy happens during this weekend (nobody dies, other than a dog, for example), but it’s just that everything finally becomes clear to him and makes sense for the first time. that’s pretty deep for a movie, and what makes it all go down so smoothly is a whole host of other characters who are equally entertaining and funny. Grady is a writing professor. at the start of the film, we listen to his voice over as he finishes up teaching a class and introduces us to two of his students. those students are hannah, (played by a pre-tom cruise katie holmes), and james leer (played by a pre-spider man tobey maguire). these were all known actors, but they also hadn’t made it so far in the mainstream yet that they would always be associated with a single role. even robert downey jr. is in this movie and for him it’s pre-iron man, pre-sherlock holmes and pre-tropic thunder. aside from grady, james leer is the other star of the movie. he is a dark and disturbed young man, obsessed with celebrity death and not very good at interacting with others. he’s the kind of kid who finds things funny that nobody else does and isn’t quite sure what the appropriate way to express that is. this comes out in a scene where he and grady sneak into the lecture of a famous author, named q (rip torn), and leer lets out a loud giggle-like laugh when nobody else in the crowd does. it’s an awkward yet very funny moment, and the kind that really shows just how out of touch with society mr. leer actually is. the movie really gets started during a party at the home of walter gaskell, the head of the english department. it’s a night time party on a friday evening and the party is meant to kick off the word fest weekend. grady brings his friend and editor crabtree (downey jr.) in from out of town, and crabtree brings along a transvestite friend. it’s all just extra character description kind of stuff. as the evening goes on, we learn that grady is having an affair with gaskell’s wife, the chancelor (frances mcdermond), and that she is pregnant. grady steps outside to smoke some pot and have a moment to himself, and that’s when he sees leer off in the distance with a tiny gun in his hand. was leer about to kill himself? it certainly seems as if he was pondering it. and so grady takes the boy under his wing. the two of them now have a couple of mini-adventures together. they explore the chancelor’s bedroom where grady shows off a jacket worn by marylin monroe on her wedding day. and they deal with an attacking dog, which leer ends up shooting. and all this is just friday night. when the boys hit a local bar, following the party, it is crabtree and grady sitting at a table at the bar making up stories about the funny looking guy sitting nearby them. turns out this character, who they come to affectionately call vernon, will comes back later in the film, starting with right outside the bar when they are through with the place. we get a very funny sort of chase scene with vernon trying to get them to start driving around and the car skidding all over the snow covered streets. snow is a huge component of this movie. just like the film the ice storm, which took place all in one night, the snow covers this weekend and really gives us a feeling like we are there. for example, in the scene where james and his parents drive off and grady sits in his car reading over james’ manuscript and smoking a joint, we can really feel how warm it is inside that car. that’s because the camera zooms out of the window of the car to show what’s going on all around it outside with snow coming down everywhere. and that moment is set to the perfect song for capturing the feelings of that point in the film, “old man,” by neil young, a song about realization and the similarities between an older and a younger man. Wonder Boys is director curtis hanson’s follow up movie to l.a. confidential. it is as different as can be from that movie, and that’s pretty amazing considering how successful and great confidential was. but hanson wanted to try his hand at something new and he pulled it off masterfully. the humor is the driving force of this movie, just as much as the characters. grady tripp is the kind of guy who is so easy going and content to just sit back and “watch the wheels go round and round” (like the lennon song that is also featured here), that it’s no surprise how james leer could want to spend a weekend with this guy. the movie continues to get more creative and build momentum as it goes on and tripp goes from turning leer over to the boy’s parents, to realizing that leer’s wanting to spend time around the professor might have been the best thing for both of them. when he and crabtree go to spring the boy from the basement of his parent’s home, it is another one of those great winter environment scenes. the movie captures it all just the way it wants to. michael douglas is on top of his game with this role, unafraid to look silly in a pink bath robe that he wears around, and rattling off some of the funniest one-liners you’ve ever heard him say in his career as an actor. 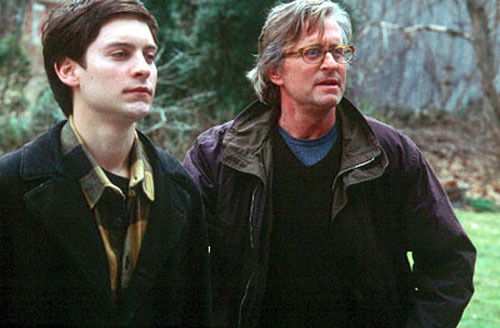 he and james have a fascinating relationship and this movie digs deep into all of it. i’m not sure i get the katie holmes subplot, other than that somebody needed to set grady straight on the story he was writing, but in all other areas this movie is a major success.